Serious, sober, function-driven design using Swiss-made components and crafted materials of the highest caliber, that what the Victorinox Alliance Line is all about. The Alliance line has steadily evolved since its earliest incarnations. This year’s new Alliance rollout emphasizes fluidity and dynamism. The lyre-shaped watch horns are elongated. Dial styles reflect the spare, essentialist design philosophy: lacquered black but not glossy; silver, satin-finished, with a sunray effect subtly catching the light; or slate grey and matte-finished. Brand new is the presence of only three Arabic numerals on the dial face — at three, six and nine o’clock. Elsewhere, raised and sharp-edged markers indicate the hour. 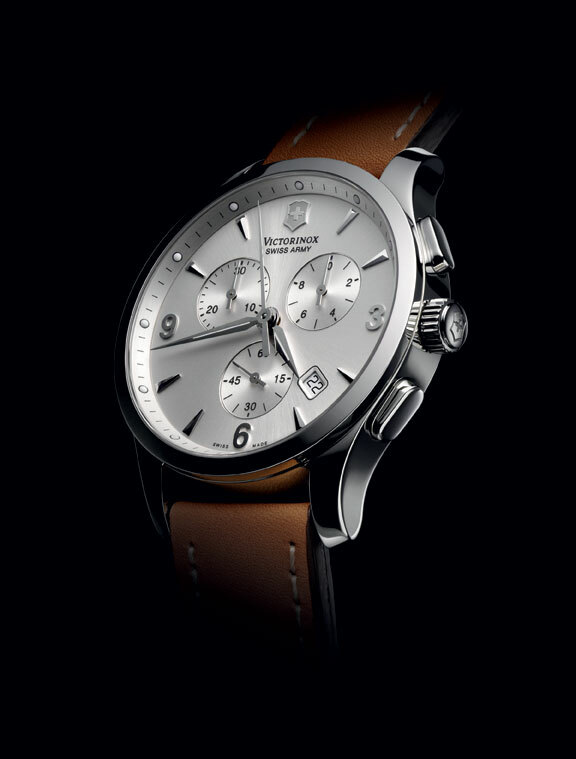 The date window is at six on the watch and angled between four and five on the chronograph. Soft leather for the strap or a classic bracelet in three-link steel, with alternating finishes or understated colour variants. Available with black, charcoal grey and silver dials and 3-row alternating-finish steel bracelet or leather strap in black, charcoal grey and camel, Alliance Line is priced between Rs 30,000 to Rs 50,000. This entry was posted on May 9, 2011 at 8:23 am and is filed under 30k to 50k, Available in India, BaselWorld 2011 launch, Chronograph, Men's Watch. You can subscribe via RSS 2.0 feed to this post's comments.